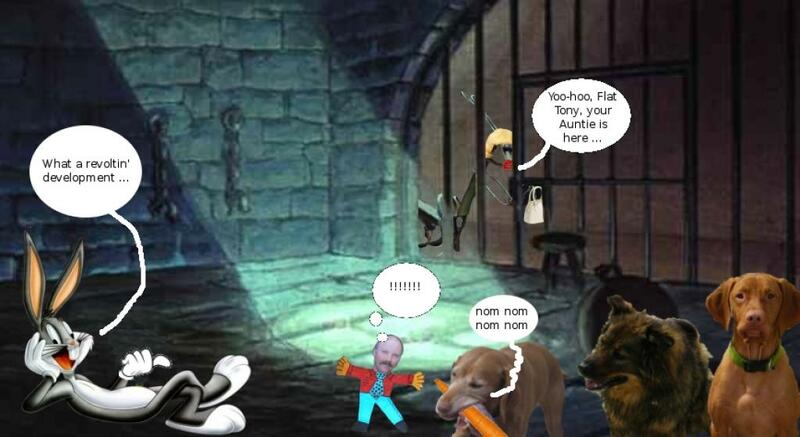 The Evil Fred says: Fantastic! Trouble is a genius! I am thinking that preying mantis is a little confoozled. Paper does not have enny nutrishunal value. Or so I hear. Ahem. Not that I have ever eaten sumthang made of paper like Daddys bills or Mummys homewerk. You cant prove it!! oh i think the cartoonist drawing this strip has had a little too much catnip! Congratulations, you’ve done it, you’ve creeped me out! I find make-up far more revolting than insects. some of the pictures are missing so we cant see what happened earlier! we were confused before……….we will come back and hopefully all will be as clear as mud! Oh my Cod! The mantis, the MANTIS!!! You guys crack us up. I wonder if this plot will get ‘nipped in the bud? Who is Flat Tony, and where did he get those pants? Dennis, I think you need one of those Acme All-Purpose-Unlocks-Anything-Including-The-Dungeon-Door keys. Oh, and PeeEss: you’re right — although I had fun hanging out with Jonny the Vizsla during my recent kennel stay, he most definitely lacked your cleverness and panache … and your cool hat! It seems Tucker sure can move quickly when food is involved…. 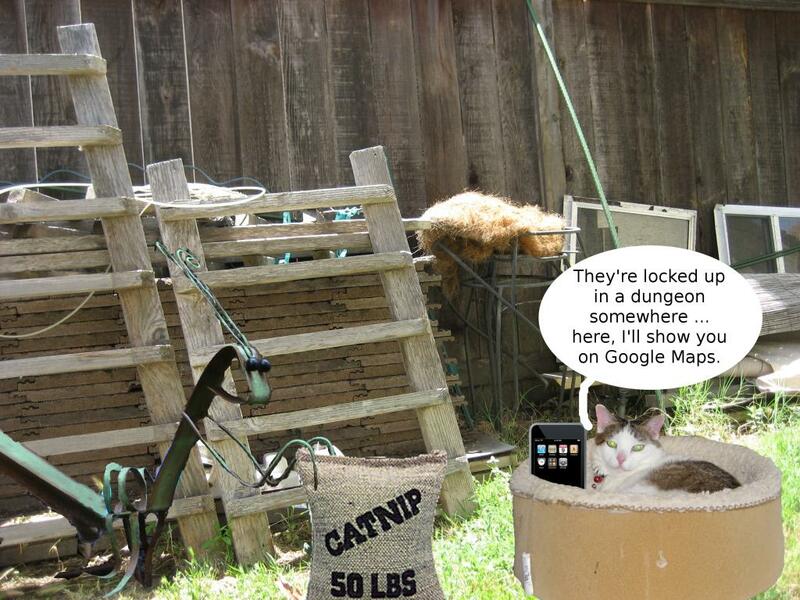 That’s a lot of catnip! Dennis . . .Dennis? Are you working on this? You know, busting loose or whatever. What is Bugs doing? 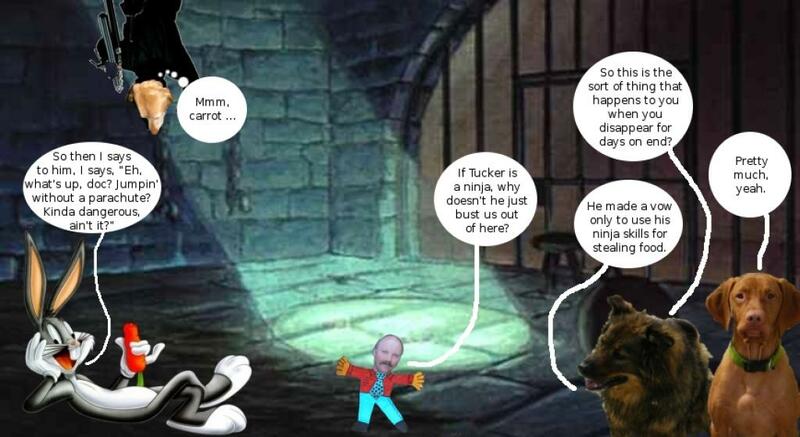 What about the evil genius Tucker? You guys gotta pick it up a little. You got SOLD OUT by that cat, I knew it!! argh. I don’t know how you are getting out of there buddy! MMMM. 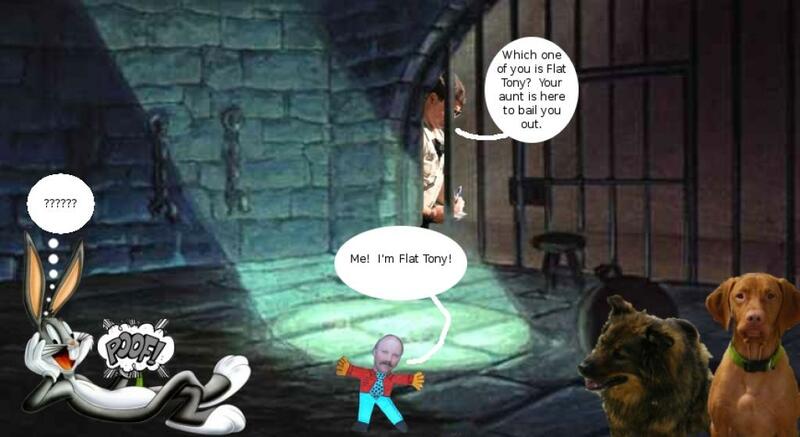 I wonder what will happen to the rest of the gang now that Flat Tony is getting bailed out. Surely he wouldn’t just leave them…..or would he? can’t trust a kittieluv can you?! especially one with an iphone. puggeash! Oh, Trouble. You are so naughty. We need to send you to a rehab unit in Malibu, obviously, where you may join other celebrities in a posh and completely non-judgemental atmosphere where you’ll be provided with so many gourmet tuna dishes that you’ll forget catnip entirely.